This article was published in the May 2010 issue of All Things Strings. In other words, there’s more to a tailpiece than meets the eye. While the primary function of the tailpiece is to connect the strings to the end of your stringed instrument, tailpiece can have a significant effect on the sound and playability of your instrument. The right tailpiece, installed in its proper position, can make an instrument more responsive and easier to play, accentuate the harmonics and overtones, and make the instrument more resonant. This added resonance can result in a fuller and more colorful tone. Conversely, if an instrument has some undesirable vibration, such as a bad wolf note, a change of tailpiece and its position can help reduce it. While more empirical research is needed on this subject, it is doubtful there will ever be a “one size fits all” solution, and experimentation will be needed to achieve the optimal tailpiece for a particular instrument and playing style. To make matters more complex, there is also significant disagreement among violinmakers and adjusters about the effect different tailpieces and tailpiece materials will have on sound. That said, there are some useful areas of comparison. Let’s look at factors that can make a difference. 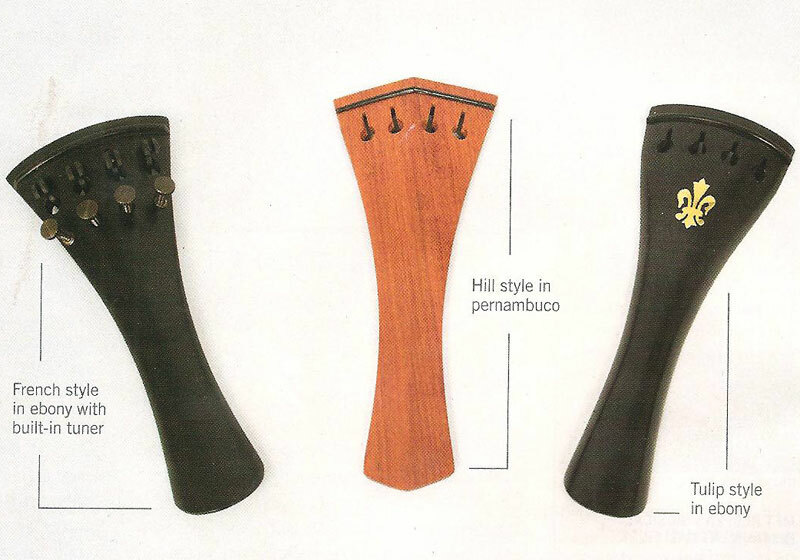 The most commonly used woods for tailpieces are ebony, boxwood, and rosewood. Recently, pernambuco has begun to be used as well. These woods all look different but they also differ in their structure and density, which changes the effect they have on sound. These differences can be very subtle and are often open to dispute, but there may be a few general areas of agreement among a number of makers. Pernambuco tends to help and overly dark and muddy instrument become brighter and more focused. Conversely, and instrument that is too intense and hard-edged sounding can be warmed up and deepened by a dense ebony tailpiece. When a light tailpiece is desired, less-dense woods such as boxwood and rosewood may lend themselves more readily to the situation. Ebony and pernambuco can be made very thin to achieve a light weight, but doing so can make them prone to cracking. Perhaps more important than the wood a tailpiece is made from is the requirement that a tailpiece be the proper weight. The common impression is that a lighter weight is always better may not always be true when it comes to tailpieces. Doubtless, there are instruments on which a light tailpiece is desirably and can improve its sound. However, on many instruments, a tailpiece that is too light can interact negatively with the instrument’s patterns of vibration and contribute to wolf notes. A tailpiece that is matched with the instrument (usually one whose pitch does not interfere with the pitch of the body of the instrument) can give more warmth, body, and color to the sound and will help dampen wolf notes. In practice, this can often mean using a heavier tailpiece. In any case, a violinmaker may try a number of tailpieces of different densities to find the one that works best for a particular instrument. When it comes to tailpieces constructed from aluminum, plastic, and graphite composite, the same weight criterion applies, but there are many other factors to consider as well. There are sure to be instruments on which a metal or synthetic tailpiece works well. Sometimes the improvement thought to be from the tailpiece material, whether metal or synthetic, may actually be due to the thin wire used for a hanger on these non-wood tailpieces. When a properly fitted wooden tailpiece is used on conjunction with a wire or Kevlar tailcord, the wood tailpiece may give an instrument more warmth, body, and tonal color than a metal or synthetic tailpiece. Most tailpieces come in one of the three common models: the “Hill” or “English,” which has a peaked, roof-like shape; the “french,” which has an elegant rounded shape; and the “tulip,” which has a wineglass or tulip shape. The differences between the different tailpiece models don’t have a significant effect on the sound. What really matters when it comes to tone is the tailpiece length, the position of its string slots, and tailcord holes, and the arch of the tailpiece. The length of the tailpiece must correspond to the length of the instrument — instruments that are longer from the bridge to the bottom of the instrument need longer tailpieces, and vice versa. Altering tailpiece length is also another wolf-suppression technique. The string holes and slots should not be too close together. Looking directly down at the top of the instrument, the strings should not angle inward too much from the bridge to the tailpiece. Many violinmakers prefer that the tailpiece arch conform to the arc of the bridge so that, looking at the instrument from the side, all four strings will have the same angle from bridge to tailpiece. Finally, the tailcord holes at the bottom of the tailpiece need to be level and the proper distance apart. A narrower distance may help to accentuate the middle strings, a wider distance the outer strings. The proper distance between bridge and tailpiece (the after length) can enhance harmonics and the response of an instrument. The distance is determined by tuning the after length of one strong to a specific pitch by adjusting the position of the tailpiece. For example, on violin, the after length of the D string can be tuned to an A; for cello, the G string after length should be a C.
Using post-style string adjusters on a tailpiece can interfere with this after-length distance, as well as add a lot of weight close to the bridge where it can dampen sound. In practice, using one post-style string adjuster on the top string of a violin or viola doesn’t have much noticeable effect, but using them on all four strings can be detrimental to sound, especially on cellos. A great, threefold advantage of tailpieces with built-in tuners is that they maintain proper after length, reduce weight at the bridge end of the tailpiece, and are less likely to cause buzzing.